Redneckdude's Fabulous HoneyGlow Wallpaper render for this modified composistion for the Logon! Many thanks to him for the generous use of this great wall!!! There are 4 Different walls in the wallpak @ 1920x1080. Two for the Logon and 2 for the walls. 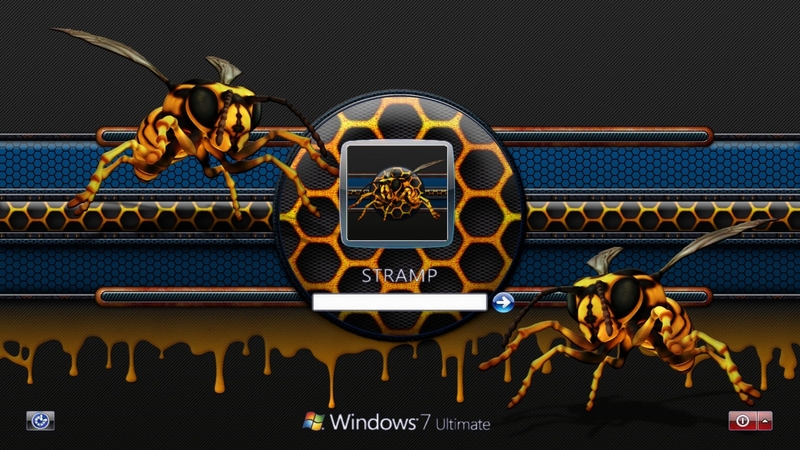 This Logon is the HoneyGlow_Bee_Drip.There is a Beecon custom User icon included in the file for the theme! Made with RealDraw Pro5,XPSLARA,Paint.NET. The Bee is 3D. The preview had to be custom created as I had a problem with the preview image displaying correctly. But the Logon runs and displays very well. Permission and credit in the file download. Get your glow on! Can't ever go wrong with Jim's awsome "so called" old school skinning. He likes clean, basic, usable that promotes productivity. I tend to scare people (LOL) and go for the unusual tho I like a clean non busy skin that is visually arty. This preview has a liitle more busy but the wallpak has a similar one that doesn't expound busy as much. I tried not to overpower his vision as the walls are a little more styled to be usuable backgrounds. The logons are meant to attract attension. What can I say I got a wild hair one night after talking with him one night! Thx from both of us Jim! Thanks Jamie! Started with a well balanced solid wall from Redneckdude!